We are simple folk who love simple pleasures in life. Jay and I enjoy good wine, great food and time with our friends and we like to spend money on those things. It's a large stealer of our discretionary income and that's okay with us. Everyone gets to choose how they use their play fund. However, when it comes to champagne, we are definitely full-throttle in the scrimping territory. I'll put it this way: Everytime I've purchased champagne in the store, I am bending over in order to do so. Bottom shelf Cook's it is. 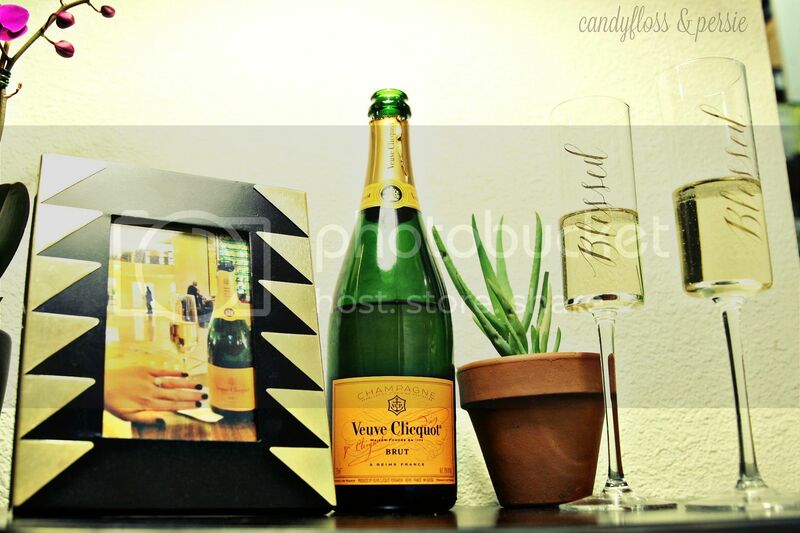 And without caring about my bubbly palette, that has suited us just fine. Except there is one day a year when we loosen the purse strings a bit more. 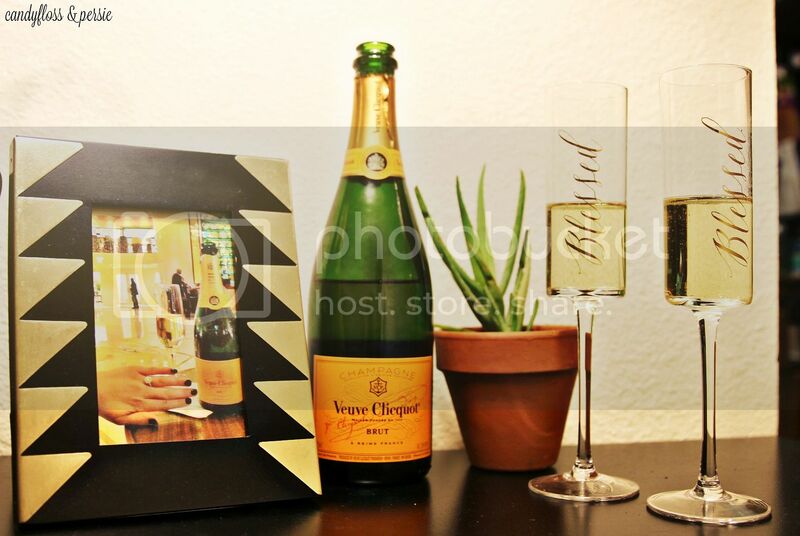 And that's because we've agreed to always toast the day we got engaged with the same effervescent bubbles that we did on that wonderful night in 2013, Veuve Clicquot. I'm no denier of the fact that relationships require a ton of work and are often difficult. It can be hard to expect another being to understand everything about you and meet all of your physical and emotional needs. There's disagreements, humility, disappointments and a whole lot of compromise. On the other hand, they serve as mechanisms for personal and communal growth and create a framework of delight around all other aspects of your life. A good relationship brings peace, joy, security, convulsive laughing, cherished dumb jokes, compassion and true jubilation. A good relationship can be everything. I'm happy to always toast to the day we decided to commit to the good and bad together. And I'm happiest even to forever use this champagne as a little nod to the very beginning, a very good place to start. Happy Monday of this short week! And your paragraph about the good and the bad is really good. Very true. I'm right there with you spending discretionary money on good food and good wine! Plus we're both in the "DINK" (dual income no kids) category, so we should be able to spend money on this fun stuff while we can! 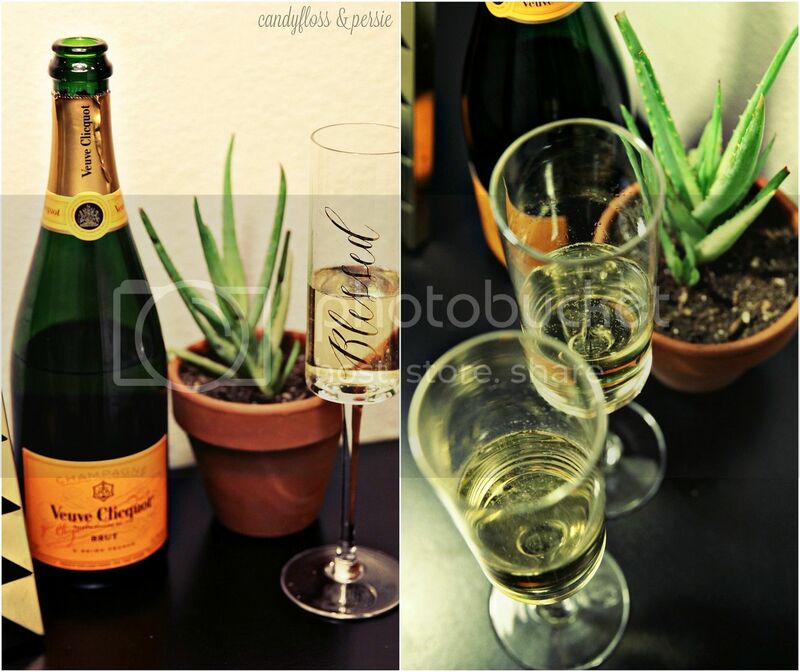 I love that y'all continue to drink the same champagne that you drank after your engagement! 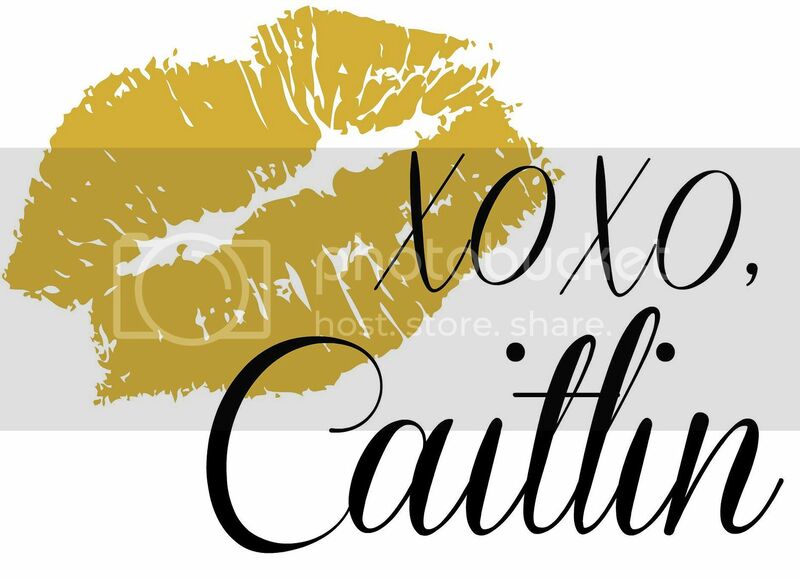 What a fun tradition that's a great way to remember your engagement! I love all the little traditions you two seem to have! They're always so endearing and I've read that making those little traditions like that really strengthens a bond. 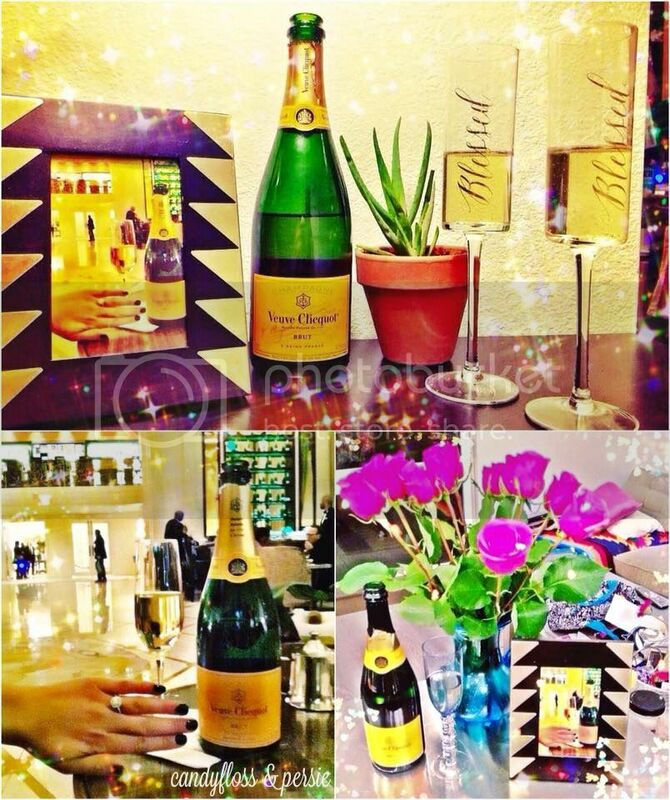 I've only ever had Veuve Clicquot once for my graduation, but I quite liked it! Awesome tradition! 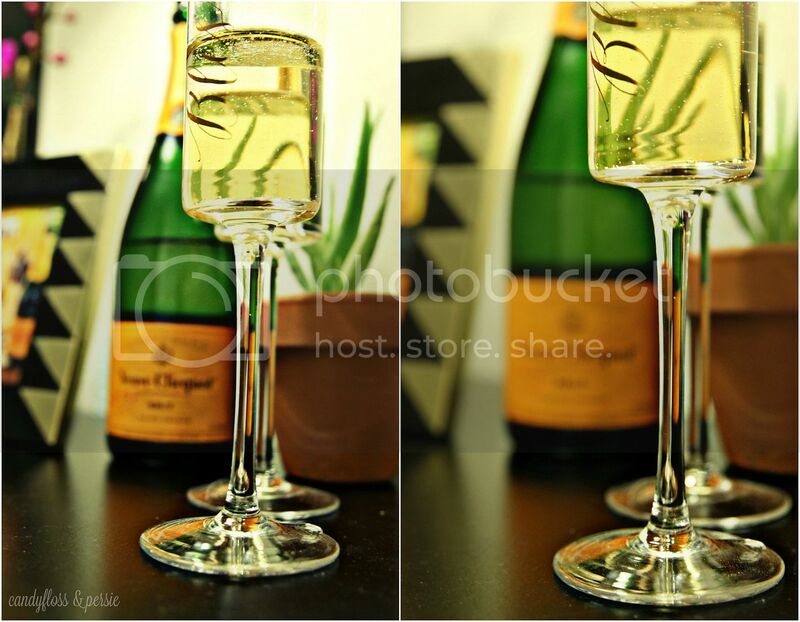 And loving those champagne flutes! If I were you, I would be celebrating it each month. Also because I would love to have a good reason to always have a drink. This is a sweet post:) Happy Thanksgiving! PS Love those champs flutes! Love this!! 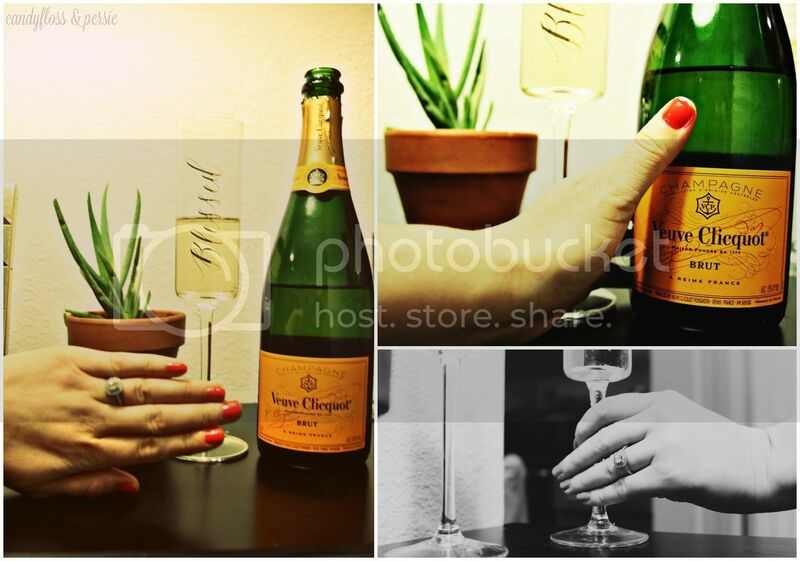 I love love love Champagne especially Veuve Clicquot! awww i love the tradition of it :) do it forever! This is a beautiful tradition and I'm so glad that you keep to it! I'm also incredibly jealous because that is the one champagne that I have always wanted to try. One day. For now, I'm quite content with Cooks. Have always loved them and the Spumante is my current favorite.